The film received numerous accolades, including two nominations at the 76th Golden Globe Awards (winning Best Original Score), ten nominations at the 24th Critics' Choice Awards (winning Best Editing and Best Score), seven nominations at the 72nd British Academy Film Awards, and four nominations at the 91st Academy Awards (winnning Best Visual Effects). ^ "Why 'First Man' prominently features Gil Scott-Heron's spoken-word poem 'Whitey on the Moon'". Archived from the original on October 17, 2018. Retrieved October 16, 2018. (Subscription required (help)). 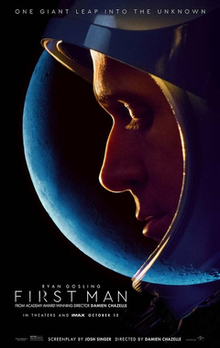 ^ "Ryan Gosling's First Man is a space hero with soul". Archived from the original on October 15, 2018. Retrieved October 15, 2018. (Subscription required (help)).